A little something from you, as you say goodbye to your class! With the school year winding down you may be thinking about a good-bye gift for the kids. The craziness of the classroom, and all the end-of-year activities make it hard to find the time or money for something special. These Summer Survival Kits are the perfect solution. They’re easy and affordable! I’m showing two options, one you assemble, the other is assembled for you! There’s also a sample note you could include. Take your pick, and have fun. Your kids will appreciate them. 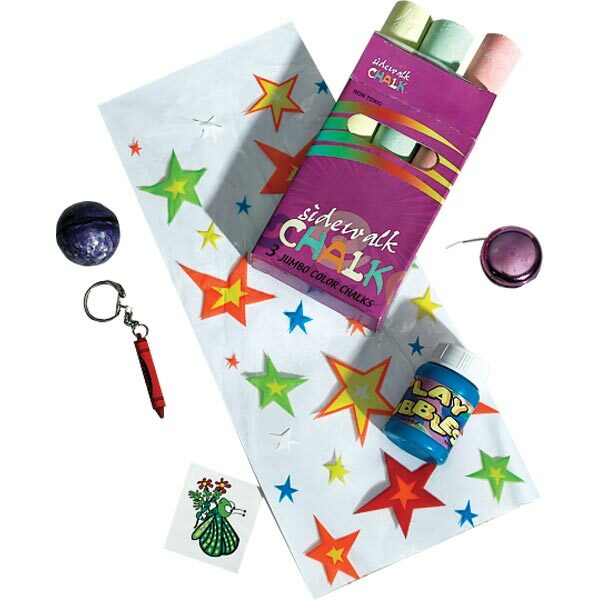 Get some pre-assembled bags of goodies and attach your own note to personalize it. These Summer Fun Packs would be perfect- and are very affordable! Assemble your own Summer Survival Kits! It could be a classroom activity; set up stations around the room with each item and the kids can go around and fill their kits. Then you collect them, attach a cute note and hand them out on the last day. Or fill them yourself to keep it a surprise for the last day. 1. Start with a bag of some sort. You could use something as simple as a brown paper lunch bag and have the kids decorate them. Party favor bags or small gift bags work great too. You could get more extravagant and use school supply pouches or inexpensive backpacks. 2. Fill your bag with anything you desire. These are ideas we came up with, but you could certainly get creative and fill it with anything you like. 3. Attach a note with a short message from you and fun tidbit about each item. What do you traditionally do for your kids at the end of the year?